Today the new DNA site – DNA.land – did a major update which vastly improved the display page for matching relatives and also got rid of the false matches that we all initially saw. Personally, I love the concept of crowd sourcing DNA science. This new site, created by a team at Columbia University, promises on its about page that you will “learn more about your dna and contribute to important scientific research.” It is also “in partnership with the National Breast Cancer Coalition (NBCC) to better understand the genetic risks of breast cancer.” So of course I had to try it out. I uploaded the raw DNA data for my Dad, myself, and one aunt in the first day of its operation. You are shown only top 50 matches in their database. Initially it was 20 so I did not upload the 20 or so kits I control. In the first week there were many false matches, but now those are gone and my only matches are my known relatives. The database is now at about 6000 and it seems to grow by just under a thousand each day. My initial impression is that the site is very attractive but is not very useful yet. I am impressed by how quickly they improved the relative matching, so I look forward to their future features and improvements. Addendum: I forgot to mention my suggestion to put your GEDmatch id as a middle name (part of your first name) so that your matches can cross check the match over at that site. How Timely……For the past couple of days I have been thinking about uploading to DNA.land but wanted to know more before doing so…..
Will be reading the info on the links that you provided and make up my mind. It appears that even though there may not initially be a lot of direct benefit to my family research, that the data will be used for a valid scientific purpose. Who knows what benefit we all may reap from that. Thanks for your insight on DNA.land, Kitty. I’m sure in time its value will be recognized more. I love that we have a community who thinks outside the box and develops tools that further the knowledge of our genome. It’s very exciting to see another grass-roots DNA project. Personally, I like Gedmatch more. It’s a little disheartening to see “other” listed as close to 15 percent. Do you know what “other” typically means Kitty? They don’t break down the origins so I have no clue what North/Central Europe, South West Europe, and other means to them. I guess that isn’t their primary study as of now. DNA.land it at the early stages and the ancestry composition is not very advanced yet, so yes use the GEDmatch admix calculators for your ancestry. I am going use DNA company in England it has over 80 regions plus 28 in great Britain alone . not sure name will post when I find out .don’t remember of top of my head . ancestry shows no African or native American . nor does 23andme . nor does family tree. Ged match k13 showed 0 sub African but shows 1.00 east African . but another shows less. . Dna land says it doesn’t matter which you upload. to me it should not make any difference . 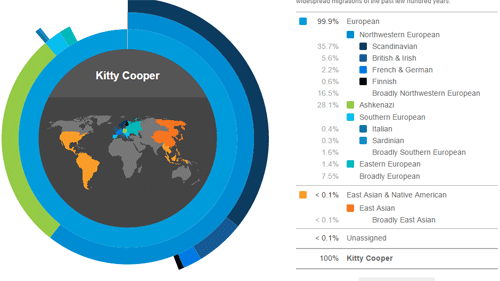 ancestry gave me one result and 23andme another which was more accurate . If you have not get 23andme get results than upload to DNALAND .for some reason they give false results with ancestry with some customers. Now its changed completely the African and Dravidians with Asian has disappeared. DNA.land and Gedmatch were way more accurate than my 23andme results. I was so upset after seeing my results on 23andme, so glad that gedmatch and DNAland are available. 23andme didn’t mention my Spanish ancestry, Southwest Asian, Russian or Middle Eastern at all, but the other two did. Have you tried the speculative view at 23andme? I just uploaded to DNA Land yesterday. Got my results. No big surprise. Not so different than others. Two questions: 1). Still no relatives at all. Does it simply take time to compare matches? Or it’s just a very small database so far? 2) I want to upload my parents and children’s files and read here that others have done so. How can I do that? Very simple on Gedcom, but don’t see how to do here. I should mention. In total, I have 4 other immediate family members, my step mother and her brother and an uncle. 7 in total that I would love to upload but don’t want to create a seperate account for each one. Too big of a hassle. Each person needs a separate account. The workaround is to get a gmail address and add a plus to it for each person then they all come to the same place so tidwellgenealogy+john@gmail.com will go to tidwellgenealogy@gmail.com – additionally that address can forward to your real address. How long does it take for Find Relatives to reflect relationships? My parents and children were registered yesterday (thank you for advice). Ancestry report all available after only a few hours but nothing in Find Relative Report for any of us still. About how long does it take? Thanks again! Hi Kitty I noticed DNA land converts raw ancestry data to 23 and me data format. Do you think I could use this data to upload to ftdna since the ancestry option isn’t there due to chip differences for the newer ancestry tests? Actually a fellow genealogist tried this and there were too many breaks, but the really good news is ftDNA is fixing the final kinks and should be accepting uploads rrom the new chips by Christmas! Hi Kitty, I am actually looking for info about Genes for Good.I did this test and I know I can upload to GedMatch but I I think it might have been you that said eaither Geni or Legacy would accept their raw data for matching? If it was not you would you happen to be aware of where I can find this info? Thank you so much in advance for helping. Sorry, not me and ask Google. Yes gedmatch can take them which is great!